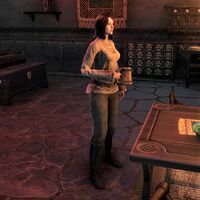 Calysa Velain is a Breton drunkard who can be found at the Vivec City Furnishing in the Canton of St. Delyn the Wise in Vivec City. She has no unique dialogue. This page was last modified on 28 April 2018, at 01:00.